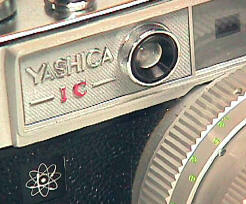 The 1968 Yashica Lynx 14E is one of the few leaf shutter RF's with a fast 1.4 lens, and it is also among the first cameras to offer the modern wonders integrated circuitry -- hopefully a good thing. The Killer feature is electronic manual exposure control. Pushing the little silver button on the right front of the camera turns the meter on. You see a "UNDER" or "OVER" light in the viewfinder. Turn the shutter speeds or f/stops until the lights go out, and you got the exposure. The bottom line is that the photog has more control over the camera and exposure. 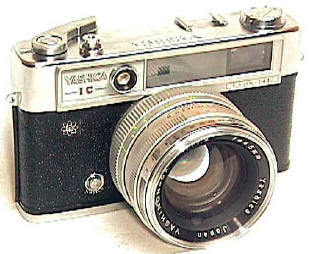 35mm Rangefinder with fast 45/1.4 lens, focusing to 30" The immense 1.4 lens dominates the camera. The Lynx is in an elite club. 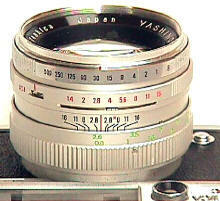 The number of leaf shutter 1.4 lensed rangefinders can be counted on one hand. VERY Nice viewfinder/rangefinder with a projected parallax corrected frameline. Over/Under exposure lights in the finder, but I doubt if they are LEDs. You adjust the f/stop and or the shutter speeds until the correct exposure is indicated. Still very usable today, the Lynx 14 Electronic strangely has no current production equivalent with a leaf shutter 1.4 lens.